TextMate has great syntax highlighting skills. Sometimes I'd like to copy code snippets from TextMate to VoodooPad, and I'd like to bring along the text highlighting. 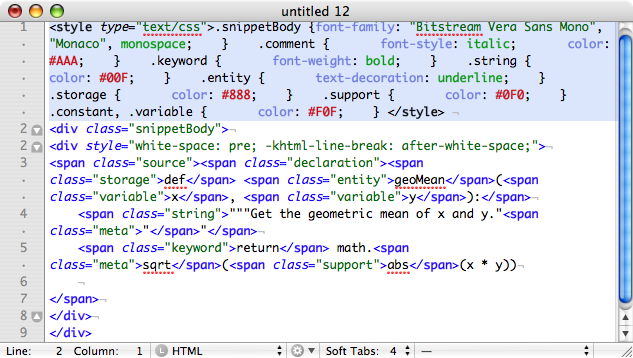 A simple copy-and-paste from the TextMate edit window doesn't do the job -- after all, it's a text editor. Fortunately it is possible to copy with syntax highlighting. The procedure is pretty simple, if a bit obscure. Select the text of interest in TextMate. A new "View Document as HTML" window should appear. Select the text in the window and copy it to the clipboard (Command-C). Switch to Voodoopad and paste (Command-V). 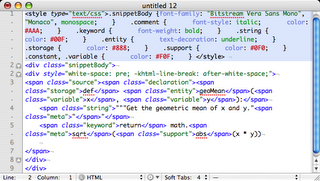 With a little more work you can paste syntax-highlighted snippets into MarsEdit. Start out as above. Once the "View Document as HTML" window appears, select View->View Source. Another new window should appear which contains raw HTML. Select it all (Command-A), copy it (Command-C), switch to your MarsEdit window and paste (Command-V). But first you'll need to re-work the content a bit, since it includes a <style> section which applies to your entire post. Be sure to collapse the entire style section onto a single line, lest Blogger should insert a bunch of <br/> tags. """Get the geometric mean of x and y."""